Our team consists of musical professionals with a passion for music education, performance and research. Rosina Christina Moder was born in the Styrian Hills of South-east Austria and has resided in Jamaica since 1985. She graduated from the University of Music and Dramatic Arts in Graz, Austria, with a Certificate in “Kindersingschule” - Early Childhood Music Education (1974), a Bachelor’s degree in Recorder Teaching (1976) and a Masters degree, (Hons. ), in Recorder Performance (1977). Rosina received her post-graduate studies at the ‘Schola Cantorum Basiliensis’ (Jeanette van Wingerden) in Basel, Switzerland, and at the Music University ‘Mozarteum’ (Nikolaus Harnoncourt) in Salzburg, Austria. Her performance career has taken her from Europe, Japan, Argentina, and the United States of America to Jamaica and the wider Caribbean. ​Rosina is co-founder and executive director of the ‘Music Unites Jamaica Foundation’, a non for-profit organization with the mission of raising funds for music scholarships and mentoring talented students in need. Research on Jamaican composers, as well as hosting free concerts and workshops island-wide, are further aims of ‘Music Unites Jamaica’. 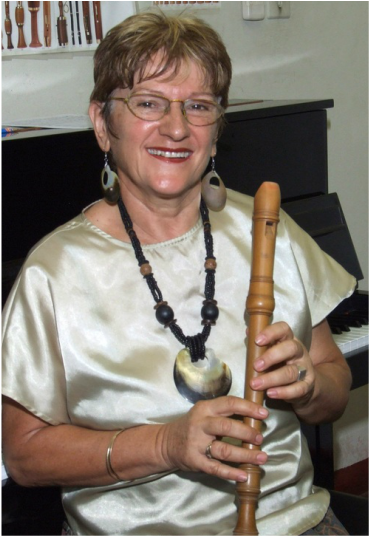 Rosina is also the founder and musical director of ‘Flauto Dolce’, the Jamaican Recorder Society. Peter Ashbourne attended the St. Hugh’s Preparatory School, the Wolmer’s High School for Boys, the University of the West Indies in Kingston, the Jamaica School of Music, and has a Bachelor of Music (composition) degree from the Berklee College of Music (Boston, Mass., USA). Mr Ashbourne, who holds a LRSM (Performance) diploma in violin, was considered a child prodigy on that instrument from as early as age 9. He also plays the piano. ​An experienced composer, arranger, performer and band leader, Ashbourne taught at the ‘Jamaica School of Music’ in its Jazz Department from 1976 – 1979. He conducted an Art Music and Reggae Workshop at the ‘University of Music and Dramatic Arts – Graz’, Austria in 1986 and held a lecture and seminar on the ‘Development of Jamaican Popular Music, from Mento, Ska, Reggae to Dancehall’ at the ‘University of Southern Maine’, U.S.A., in spring 2007. His lecture ‘Two Turning Points in Jamaican Popular Music’ held at the Global Reggae Conference 2008, at the University of the West Indies was universally well received and was published in the Book ‘Global Reggae’ in 2013. Peter Ashbourne was appointed to the position of ‘Senior Music Fellow’ by the University of the West Indies, Mona Campus in Kingston in January 2013. He has adjudicated in various institutions and at various events from music schools to regional song contests, such as the ‘Caribbean Broadcasting Union (CBU) Song Contest’. He also is the arranger of songs in “tu tu tu tu”, Rosina Christina Moder’s Caribbean recorder teaching book, first published 1993, as well as co- founder and member of the board of the NGO ‘Music Unites Jamaica Foundation’.